At Enchanted Waters we believe in advanced beauty solutions that harness the best of pure natural organic ingredients to deliver higher quality beauty products that provide real results, enrich your well-being, and sustain the earth. We understand that, with so many products, it can be a daunting task to figure out what is right for your skin and in what order to apply. Thus, we are happy to present our extensive guide of daily skincare routines. Our NUMBER ONE TIP, that applies to ALL skin types: Start using serums, appropriate for your skin type, both morning and night. Serums are now the Front-Line in the Anti-Aging war. SAVE $$$ All NORMAL SKIN products listed below can be purchased individually or HERE IN A KIT at a 30% Discount. Your skin is normal if it isn’t particularly oily or dry and if anti-aging, acne, and sensitivity aren’t concerns on your radar—in other words, the skin type all of us wish we had. This is the best skincare routine for normal skin. Cleanser: A natural, fragrance-free, pH balanced cleanser rich with antioxidants, like our Restorative Botanical Facial Cleanser, will gently lift away oil, makeup and impurities, keeping your skin fresh and radiant. Toner: Look for an alcohol-free toner that has ingredients like Glycolic Acid (for smoother looking skin and cellular stimulation), Geranium (an essential oil good for cutting oil), and Witch Hazel (a natural ingredient with an astringent effect without the drying effects of alcohol). Try our Botanical Anti-Aging Facial Toner, for a boost of energizing, brightening hydration. Moisturizer: When you moisturize, do two applications. One on the face and one on the neck. A light moisturizer like our Restorative Moisture Face Cream will protect your skin and hydrate without clogging your pores. For those days you spend time in the sun you may want to consider our SPF-30 Protect and Restore Day Moisturizer. Containing only the best sun protection ingredients, it sooths and nourishes skin with botanical extracts for extra hydration and rich anti-aging moisture. Antioxidant Serum: Look for an antioxidant serum with brightening ingredients like vitamin C, as well as naturally revitalizing ingredients like Hyaluronic Acid and MSM. You will love our VITAMIN C SERUM 30% + E + FERULIC ACID in 100% HYALURONIC ACID Base. 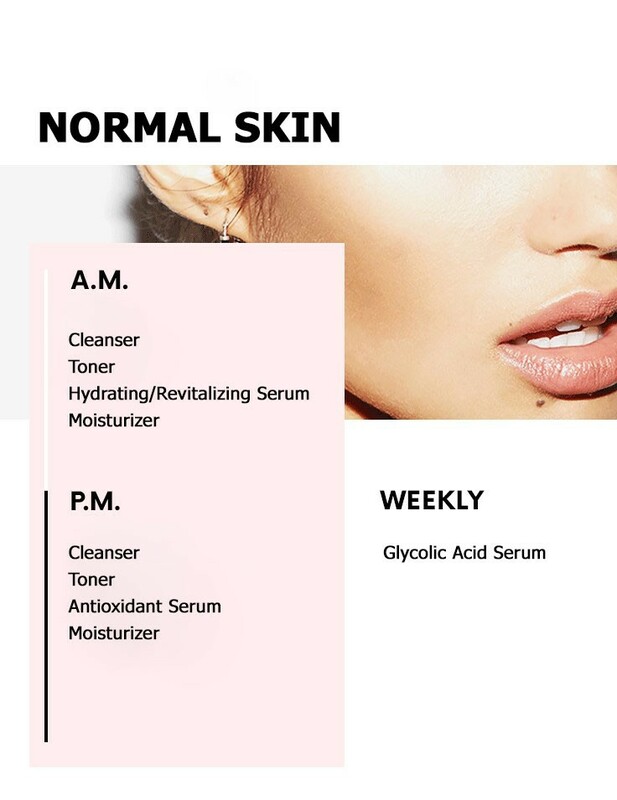 AHA Serum: When it comes to keeping your normal skin normal, we suggest incorporating a Glycolic Acid Serum into your routine a few times a week. Try our Glycolic Acid Anti Aging Wrinkle Cream Serum, with Hyaluronic Acid and CoQ10. If there is one TURN BACK THE CLOCK product that every person over 25 should have, this is it. Filled with the most medically advanced clinically proven and mostly organic ingredients available. Restore firmness, reduce the appearance of large pores, heal sun damage, increase hydration, erase wrinkles, smooth texture, nourish at the dermal layer, minimize irritation, increase skin brightness and even out skin tone. ALL THIS IN ONE AMAZING PRODUCT. SAVE $$$ All DRY SKIN products listed below can be purchased individually or HERE IN A KIT at a 30% Discount. 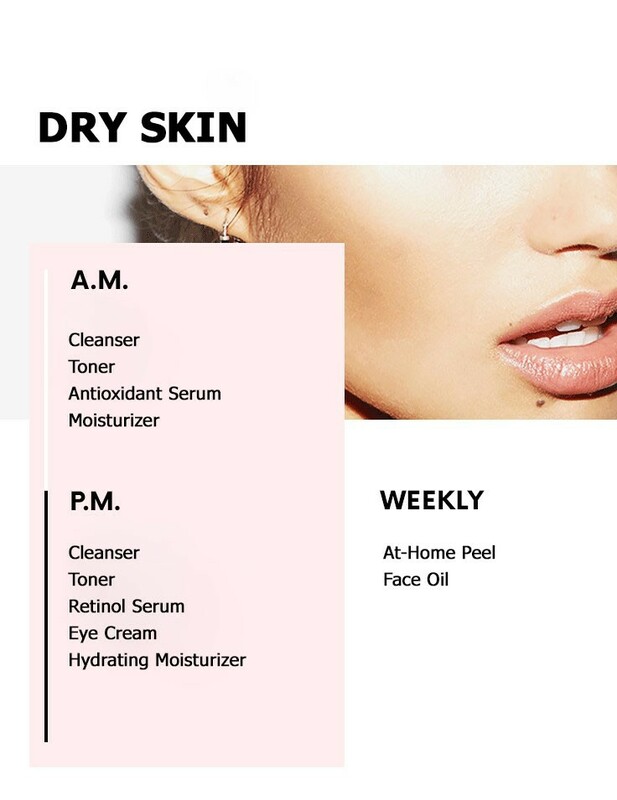 The best skincare routine for dry skin contain products that keep skin hydrated. Dry skin has a damaged moisture barrier. Your skin has invisible cracks in it and it allows moisture to escape and irritants to get in more easily. Cleanser: A mild, natural, fragrance-free, pH balanced cleanser, like our Restorative Botanical Facial Cleanser, is best for those with dry skin. Toner: Look for an alcohol-free toner, with botanical actives and vitamin C, that has ingredients like Glycolic Acid (for smoother looking skin and cellular stimulation), Geranium (an essential oil good for cutting oil), and Witch Hazel (a natural ingredient with an astringent effect without the drying effects of alcohol), such as our Botanical Anti-Aging Facial Toner, for a boost of energizing, brightening hydration. It is wonderful for Dry Skin. Antioxidant Serum: Look for an antioxidant serum with brightening ingredients like vitamin C, as well as naturally revitalizing ingredients like Hyaluronic Acid and MSM, during the daytime to help prevent collagen breakdown. You will love our VITAMIN C SERUM 30% + E + FERULIC ACID in 100% HYALURONIC ACID Base . Moisturizer: A hydrating moisturizer is the final step in your a.m. skin routine. Try our Restorative Moisture Face Cream, which contains hydrating ingredients to help your skin retain moisture while offering protection from environmental damage. For those days you spend time in the sun you may want to consider our SPF-30 Protect and Restore Day Moisturizer. Containing only the best sun protection ingredients while it sooths and nourishes skin with botanical extracts for extra hydration and rich anti-aging moisturizing. Retinol Serum: We recommend incorporating a retinol serum, like our PURE RETINOL VITAMIN A 2.5% + HYALURONIC ACID WRINKLE SERUM, into your regimen five nights a week. Retinol (Vitamin A), in addition to raising skin hydration levels, is proven to improve mottled pigmentation, fine lines, wrinkles, skin texture, skin tone and color. Eye Cream: Look for an eye serum with peptides because they’re good for boosting collagen activity. Try our Rejuvenating Eye Serum. It is no exaggeration to say that this formula addresses every single eye area concern. Dark circles, wrinkles, sagging, puffing, loss of plump and firm, loss of tone and resilience. At-Home Glycolic Peel: Dry skin responds well to [gentle] exfoliation. If your skin is dry, it means you have dead skin cell buildup—if you try to hydrate dead skin cells, it makes no sense.” Dry skin has invisible “cracks,” so you should avoid using a facial scrub with sharp edges. Chemical exfoliants do a better job of dissolving dead skin cells without tearing at your skin. Try our GLYCOLIC ACID Chemical Peel Kit. Be sure to select the proper strength for your situation. A strength chart is available in the listing. Face Oil: If your skin is extremely dry, you can swap your p.m. moisturizer for a nourishing face oil like our 100% Pure Organic ARGAN OIL - Moroccan Gold, which is 100% organic and a wonderful hydrating natural oil. SAVE $$$ All OILY SKIN products listed below can be purchased individually or HERE IN A KIT at a 30% Discount. Oily skin has larger oil glands and a high sebum content. This is genetic. Oily-skinned women have built-in oil, so the goal is to lessen the oil activity by keeping your skin cells lightly hydrated. The skincare routine for oily skin contain ingredients that help control excess oil production. Cleanser: In the case of oily skin, oil breeds bacteria, and bacteria leads to breakouts. Wash your skin three times a day if possible. The more oil, the more breeding ground for blemishes. We recommend using a cleanser, like our Restorative Botanical Facial Cleanser, that’s sulfate-free and 88% organic. You want agents that will cut the oil, but you don’t want to dry your skin out with too many detergents. Toner: Look for an alcohol-free toner, with botanical actives and vitamin C, that has ingredients like Glycolic Acid (for smoother looking skin and cellular stimulation), Geranium (an essential oil good for cutting oil), and Witch Hazel (a natural ingredient with an astringent effect without the drying effects of alcohol), such as our Botanical Anti-Aging Facial Toner, for a boost of energizing, brightening hydration. Oil-Free Moisturizer: If you think your skin’s oil production warrants skipping moisturizer, know this: Your skin can actually get oilier when it’s dehydrated, by overcompensating. With this in mind, choose a light, oil-free moisturizer which contains hydrating ingredients, like MSM and Hyaluronic Acid, to help your skin retain moisture while offering protection from environmental damage. We suggest our Restorative Moisture Face Cream. AHA Serum: Try our Glycolic Acid Anti Aging Wrinkle Cream Serum, with Hyaluronic Acid and CoQ10. If there is one TURN BACK THE CLOCK product that every person over 25 should have, this is it. Filled with the most medically advanced clinically proven and mostly organic ingredients available. Restore firmness, reduce the appearance of large pores, heal sun damage, increase hydration, erase wrinkles, smooth texture, nourish at the dermal layer, minimize irritation, increase skin brightness and even-out skin tone. ALL THIS IN ONE AMAZING PRODUCT. Retinol Serum: Retinol is good for oily skin because, in addition to helping your pores look smaller, Retinol (Vitamin A) is proven to improve mottled pigmentation, fine lines, wrinkles, skin texture, skin tone and color, as well as your skins hydration levels. Try our PURE RETINOL VITAMIN A 2.5% + HYALURONIC ACID WRINKLE SERUM. Clay Mask: We recommend indulging in a gentle clay mask, like our DEAD SEA Mud Mask, once a week. Make sure your clay mask doesn’t dry too much before rinsing it off. If you smile and it cracks into 10,000 pieces, you’ve waited too long, and it’s gotten too dry—this can actually dehydrate your skin. Face Oil: Face oil and oily skin might seem a strange pair, but it’s a good product to have on hand in super-dry environments or on airplanes. Use one drop of our 100% Pure Organic ARGAN OIL - Moroccan Gold over moisturizer in super-dry conditions. Also, every hour you’re flying to prevent dryness and extra oil production, but I wouldn’t recommend using it as part of your daily routine. SAVE $$$ All COMBINATION SKIN products listed below can be purchased individually or HERE IN A KIT at a 30% Discount. 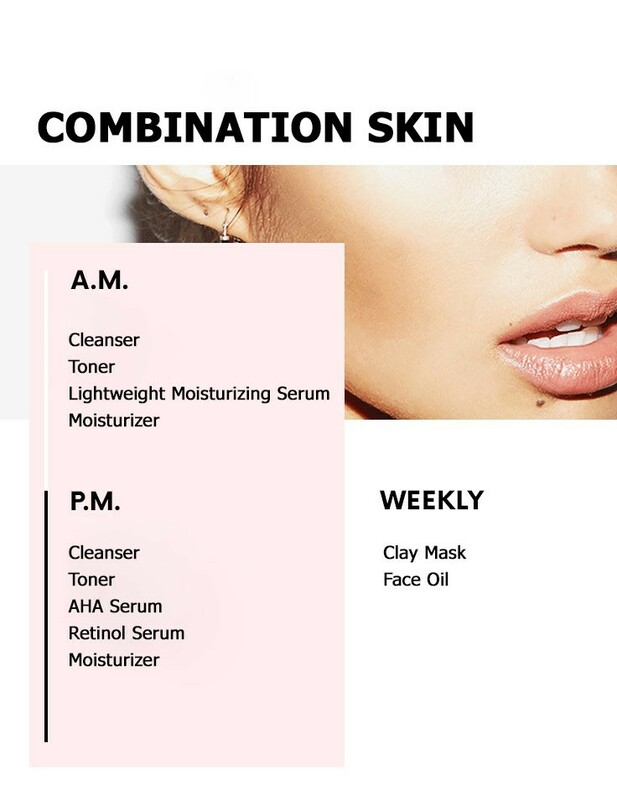 The skincare routine for combination skin contains ingredients that treat a wide range of skin concerns. With combination skin you’re oily in some places and dry in others. You don’t necessarily want to use two different routines. but instead find one in the middle of the road. Cleanser: With combination skin you have some oily areas. Oil breeds bacteria, and bacteria leads to breakouts. Wash your skin three times a day if possible. The more oil, the more breeding ground for blemishes. We recommend using a cleanser, like our Restorative Botanical Facial Cleanser, that’s 88% organic and sulfate-free. You want agents that will cut the oil, but you don’t want to dry your skin out with too many detergents. Lightweight Moisturizer: A hydrating moisturizer is the final step in your a.m. skin routine. Try our Restorative Moisture Face Cream, which contains hydrating ingredients, like MSM and Hyaluronic Acid, to help your skin retain moisture while offering protection from environmental damage. AHA Serum: Try our Glycolic Acid Anti Aging Wrinkle Cream Serum, with Hyaluronic Acid and CoQ10. If there is one TURN BACK THE CLOCK product that every person over 25 should have, this is it. Filled with the most medically advanced clinically proven and mostly organic ingredients available. Restore firmness, reduces the appearance of large pores, heal sun damage, increase hydration, erase wrinkles, smooth texture, nourish at the dermal layer, minimize irritation, increase skin brightness and even out skin tone. ALL THIS IN ONE AMAZING PRODUCT. Retinol Serum: Retinol is good for combination skin because, in addition to helping your pores look smaller, Retinol (Vitamin A) is proven to improve mottled pigmentation, fine lines, wrinkles, skin texture, skin tone and color, as well as your skins hydration levels. Try our PURE RETINOL VITAMIN A 2.5% + HYALURONIC ACID WRINKLE SERUM. SAVE $$$ All SENSITIVE SKIN products listed below can be purchased individually or HERE IN A KIT at a 30% Discount. The skincare routine for sensitive skin needs to be nonirritating. A lot of people think of sensitive skin as acne-prone, but we think of it as skin that gets red and irritated easily. It’s more delicate skin that you can’t be aggressive with. Cleanser: A gentle, sulfate-free cleanser, like our Restorative Botanical Facial Cleanser, will get rid of your makeup and any impurities without disrupting your skin’s natural barrier. Alcohol-Free Toner: Look for an alcohol-free toner, with botanical actives and vitamin C, that has ingredients like Glycolic Acid (for smoother looking skin and cellular stimulation), Geranium (an essential oil good for cutting oil), and Witch Hazel (a natural ingredient with an astringent effect without the drying effects of alcohol. Our Botanical Anti-Aging Facial Toner has all this and is filled with calming, anti-inflammatory ingredients and helps support your skin’s immune system to make it less sensitive over time. Scent-Free Moisturizer: When it comes to choosing a moisturizer, make sure to find one that doesn’t contain synthetic fragrances, which can cause irritation and allergic reactions. Avoid synthetic dyes, as well, if your skin gets irritated easily. We recommend our Restorative Moisture Face Cream which contains hydrating ingredients, like MSM and Hyaluronic Acid, to help your skin retain moisture while offering protection from environmental damage. Clay Mask: Our DEAD SEA Mud Mask is perfect for irritated, inflamed skin. It helps to put out the fire and while soothing and calming you skin. Lactic Acid Serum: Just because you have sensitive skin doesn’t mean you can skip exfoliating. If glycolic acid is too harsh, try a lactic acid product like our LACTIC Acid Skin Peel instead—it’s milder and better for sensitive skin. We suggest using a lactic acid skin peel twice a week. Just be sure to select the proper strength for your situation. A strength chart is available in the listing. SAVE $$$ All AGING SKIN products listed below can be purchased individually or HERE IN A KIT at a 30% Discount. In a skincare routine for older skin, your main goal is to plump up wrinkles, banish dark spots, and lift sagging. Your skin regimen will be similar to that of those with dry skin, with a few small differences. Cleanser: A mild, natural, fragrance-free, pH balanced cleanser rich with antioxidants, like our Restorative Botanical Facial Cleanser, is best for those with aging skin. For aging skin specifically, remember your neck when it comes to cleansing and treating — it’s a secret spot that often shows the first sign of aging. Toner: Look for an alcohol-free toner, with botanical actives and vitamin C, that has ingredients like Glycolic Acid (for smoother looking skin and cellular stimulation), Geranium (an essential oil good for cutting oil), and Witch Hazel (a natural ingredient with an astringent effect without the drying effects of alcohol), such as our Botanical Anti-Aging Facial Toner, for a boost of energizing, brightening hydration. It is wonderful for Aging Skin. Antioxidant Serum: We suggest an antioxidant serum with brightening ingredients to fade dark spots and discoloration. Our VITAMIN C SERUM 30% + E + FERULIC ACID in 100% HYALURONIC ACID Base will brighten as well as plump fine lines and wrinkles with peptides, hyaluronic acid, and resveratrol. Moisturizer: A hydrating moisturizer is the final step in your a.m. skin routine. Try our Restorative Moisture Face Cream, which contains hydrating ingredients, like MSM and Hyaluronic Acid, to help your skin retain moisture while offering protection from environmental damage. And if you’re ever confused, remember—antioxidants are your friend. Retinol Serum: Retinol (Vitamin A) is proven to improve mottled pigmentation, fine lines, wrinkles, skin texture, skin tone and color, as well as your skins hydration levels. Try our PURE RETINOL VITAMIN A 2.5% + HYALURONIC ACID WRINKLE SERUM. It is our favorite skincare product. At-Home Peel: A weekly glycolic treatment with our GLYCOLIC ACID Chemical Peel Kit will reveal fresh, clear skin and leave your complexion looking polished. Be sure to select the proper strength for your situation. A strength chart is available in the listing. Face Oil: Your skin gets drier as it ages, so consider incorporating a nourishing face oil with anti-aging ingredients, like our 100% Pure Organic ARGAN OIL - Moroccan Gold, into your p.m. skin regimen a few times a week.